on October 4, 2018, 2:24 p.m.
YouGov research into Singaporeans’ views on spirits and superstition. 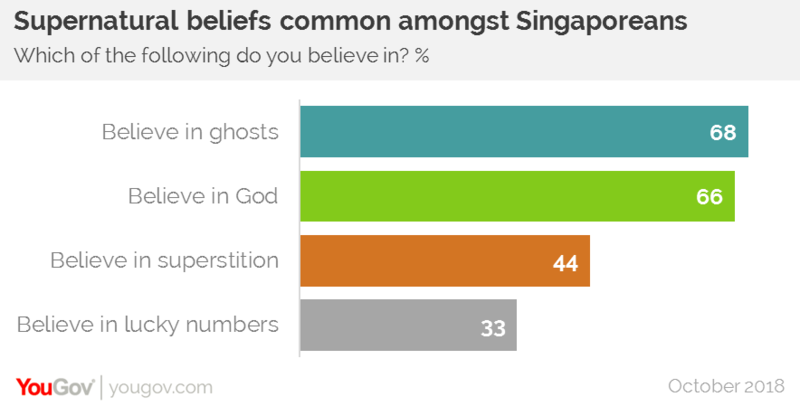 With the Hungry Ghost festival over and Halloween around the corner, new YouGov data finds that two thirds (68%) of Singaporeans believe in ghosts. Older people are more likely than younger people to believe. The data shows that while 64% of 18-24 years-olds believe in ghosts, this number increases to three quarters (74%) of those aged 45-54. The proportion of those who believe in ghosts is much higher than in the West where only half of Americans and a third of Brits believe in ghosts. Of those who believe in ghosts, more than one in three (38%) Singaporeans claim to have seen ghosts or felt their presence, while 6% have communicated with them. Many Singaporeans are religious, with two thirds (66%) of the population believing in God. 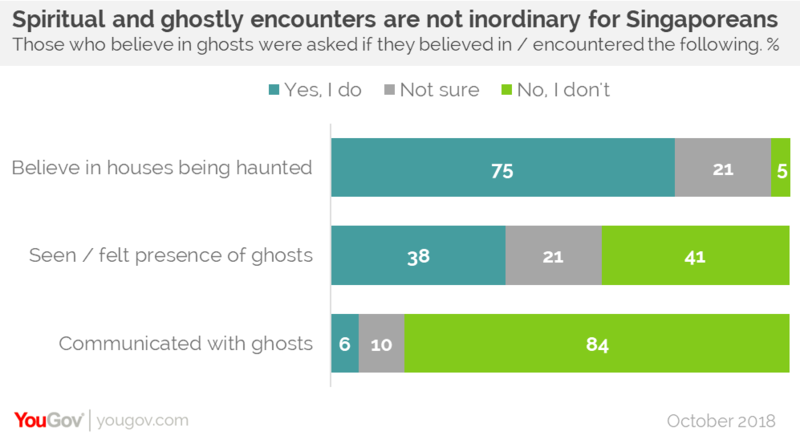 Religious people (79%) are also more likely than the non-religious (41%) to believe that ghosts exist. As well as beliving in spirits, many Singaporeans are also superstitious, with more than four in ten (44%) believing in in supernatural influences. 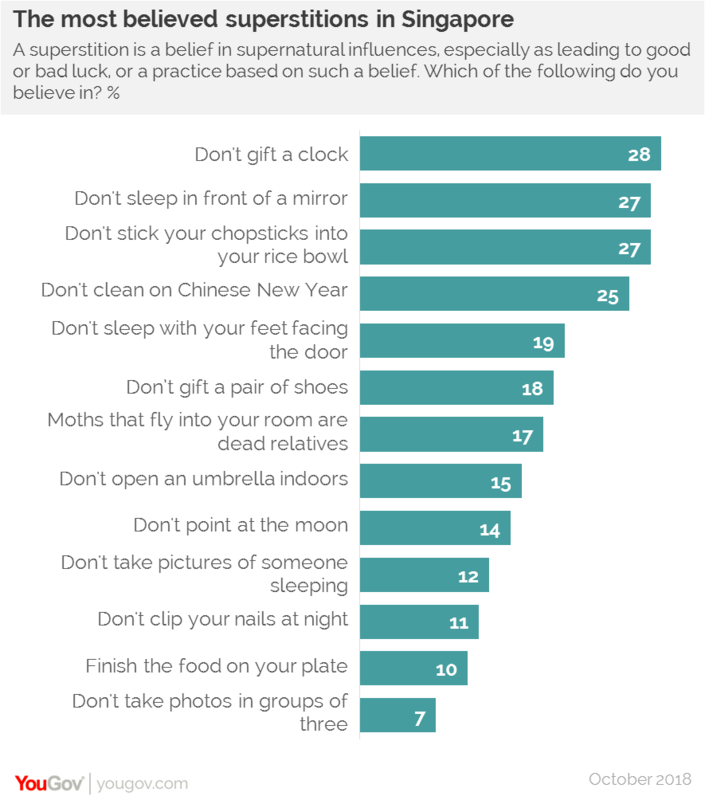 Out of the 13 superstitions YouGov asked about, the top three most believed are not gifting a clock (28%), not sleeping in front of a mirror (27%) and not sticking chopsticks into a rice bowl (also 27%). By contrast, the least believed superstition is not taking pictures in a group of three (7%). The survey finds that men and women differ in their beliefs. For example, women are significantly more likely than men to believe that you shouldn’t sleep in front of mirror (31% vs 22%). Women are also more likely to believe that you shouldn’t gift a pair of shoes (21% vs 15%). YouGov’s research finds that the Hungry Ghost Festival is a more popular event than Halloween. While one in three (32%) Singaporeans take part in Hungry Ghost Festival, only one in five (20%) celebrate Halloween. Halloween appears to be celebrated mostly by younger Singaporeans. Three in ten (29%) people aged 18-24 take part in the spooky celebration compared to only 6% of 45-54 year-olds. On the other hand, Hungry Ghost Festival is celebrated equally across all age groups. Among those who join in the Hungry Ghost Festival, the most popular ways to adhere to the tradition is to burn hell money (77%), place food offerings (59%), and avoid going out late at night (53%). For Halloween revellers, over half (57%) will mark the event by attending Universal Studios Halloween Horror Nights. Four in ten (40%) will dress up in costume, and one in three (30%) will go trick or treating.